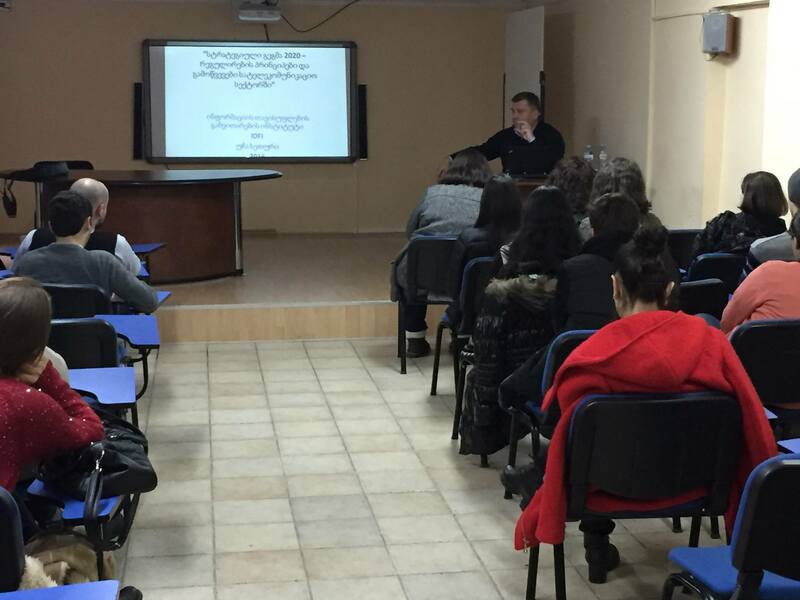 On February 8th, the Institute for Development of Freedom of Information (IDFI) organized the lecture “Georgia 2020 – Regulating Competition in Telecommunication Field” at International Black Sea University (IBSU). The course was led by Ucha Seturi – Expert in Media and Telecomunications Law of IDFI and Saba Buadze – Project Coordinator at IDFI. The courses are held within the framework of the project “Strategic Plan Georgia 2020 – Strengthening Public Involvement”. The project is implemented by IDFI in cooperation with University of Bremen and with the financial support of Federal Foreign Office of Germany. The aim of the course was to analyze the strategic significance of the Social-Economic Development Plan – Georgia 2020, as well as discussing the regulatory particularities of competition in the telecommunication field. Ucha Seturi discussed the importance of regulating competition, main principles of state policy in the field of electronic communication, as well as the functions and duties of Georgia’s National Communication Commission. Saba Buadze explained the process of planning and elaboration of the strategic document Georgia – 2020. During the lecture, the importance of policy planning was discussed, as well as novelties in the existing framework of public policy planning. Shortcomings and inherent flaws of the strategic document were also discussed during the lecture. After the lecture, the students were awarded with joint certificates from IDFI, University of Bremen and IBSU.